The Sound of Music Professor Chris Dobbins and Ben Whedon ’18 are reviving a forgotten musical score for its 21st-century premiere by the W&L Orchestra. Ben Whedon ’18 and Professor Chris Dobbins in Wilson Concert Hall. In 1920, the American composer John Alden Carpenter wrote “A Pilgrim Vision” to celebrate the 300th anniversary of the Pilgrims’ voyage to America. It had only three performances: two by the Philadelphia Symphony Orchestra and one by the New York Philharmonic. Then the score sat essentially forgotten in the archives of the Library of Congress — until last year, when Chris Dobbins, assistant professor of music at Washington and Lee University, became involved with Unearthing America’s Musical Treasures, a project spearheaded by the College Orchestra Directors Association (CODA). 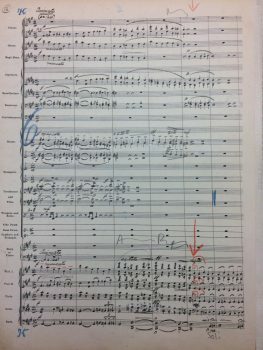 Dobbins settled on “A Pilgrim Vision,” which was written for a 42-piece orchestra and runs for a bit over nine minutes. The first step was to enter the score into Finale, a music-notation software program. That task fell to summer research scholar Ben Whedon ’18, who is minoring in music (his double major is accounting and business administration and European history). Once Whedon finishes the grunt work of entering the score into Finale, he and Dobbins can begin deciphering some of what they call the “funky” shorthand. Are the extra beats in a particular measure for two parts, or is it a massive notation violation, or is it just the way composers wrote it out back in 1920? Whedon’s last day is Aug. 15, and he plans on having a completed score ready, with all the instrument parts extracted and all the page turns synchronized. Dobbins will turn the material over to the Mary Washington University orchestra, which will play it through to see if he and Whedon need to iron out any other sections. Then it will be ready for the W&L Orchestra to rehearse and perform in March 2018.